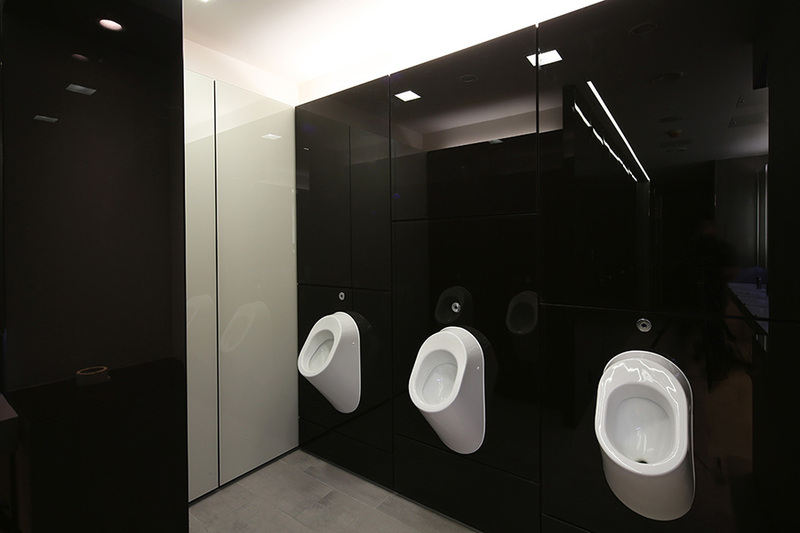 This extensive refurbishment in the City of London incorporates innovative Page Lacquer coating to provide a high gloss to the full-height Alto cubicles, in a contract worth close to £1 million. Alto full-height, in high gloss Page Lacquer. Concerto glass integrated duct panelling. Based in the heart of the City on Queen Victoria Street, the building previously the headquarters of The Royal Bank of Canada, has been extensively remodelled to a design by SPPARC Architecture. The works, managed and administered by Mellersh and Harding Building Consultancy with Bouygues UK as the main contractor included the addition of an additional floor of offices at roof level. The building now provides high specification Grade A office accommodation in this sought after commercial district of the City. Working closely with the design team, Washroom developed the design from concept drawings and, following off site manufacture, then installed the bespoke high specification washroom areas on all levels of the building together with shower facilities in the basement designed for use by office staff with particular regard for cyclists. 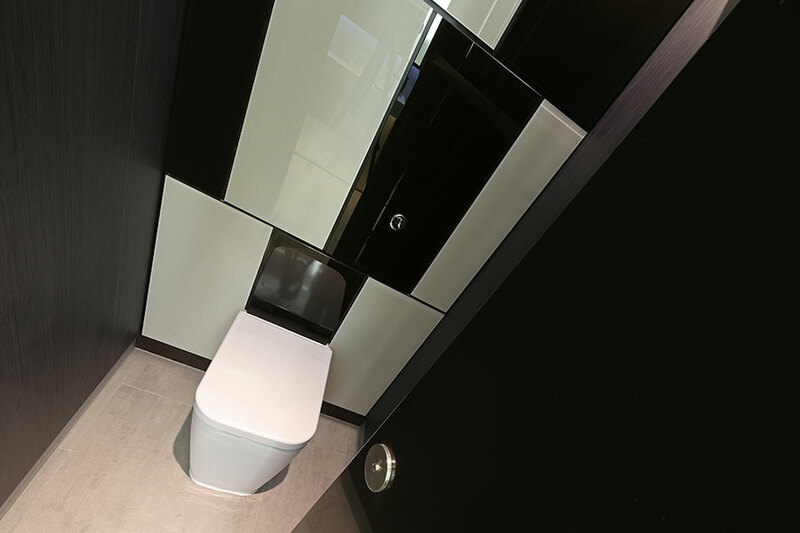 Washroom’s full height Alto WC cubicles, which can be manufactured in a range of colours and finishes, provides users with complete privacy as well as creating the home-from-home feel increasingly demanded. The cubicle doors were finished in the incredibly durable, high-gloss Page Lacquer coating, to create a unique and stylish space. Any future wear and tear can be repaired and re-polished in situ, so the coating is an ideal choice for commercial sector clients. For the vanities, Washroom installed bespoke units with mirrors and lighting designed to complement the Alto cubicles. 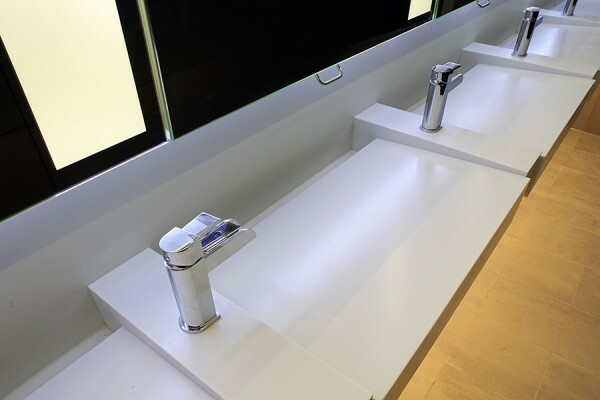 Ultra-durable and easy-to-clean Corian, manufactured in long troughs, was used for the vanities, further adding to the high specification feel. 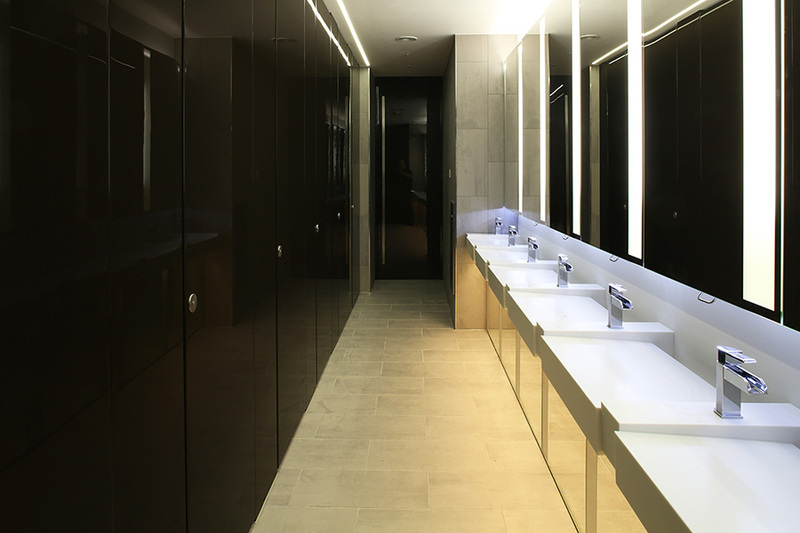 Washroom’s integrated duct panelling system manufactured in a bespoke glass design was used to add to the sleek design, while also making access for any future repairs or maintenance much easier.